Pakistan has executed two convicted militants after lifting a moratorium on the death penalty in response to the murder of over 130 children at a Peshawar school by the Taliban. It is planning more hangings and airstrikes against militants. The militants who were hanged had no links to the Taliban assault on the military school in the city of Peshawar, which is the capital of Khyber Pakhtunkhwa province, not far from the border with Afghanistan. There had been a moratorium on the death penalty in Pakistan; however this was lifted after the massacre of 148 people on December 16, the vast majority of whom were children. Mohammed Aqeel and Arshad Mehmood were the first prisoners to be sentenced to death following the lifting of the moratorium. The home minister for Punjab province confirmed the executions of the first two, at a prison in the city of Faisalabad. "We have started these executions by hanging two terrorists," Shuja Khanzada told AP. "Today's executions of terrorists will boost the morale of the nation, and we are planning to hang more terrorists next week." Aqeel had been in jail for leading an attack on the Pakistani army headquarters in 2009 in which 20 people were killed, while Mehmood was arrested for trying to assassinate former President Pervez Musharraf. Reuters reports that four militants currently in jail in Lahore are expected to be executed in the next few days. The decision to lift the moratorium on the death penalty was condemned by Amnesty International. The Pakistani army also said they carried out military strikes against Taliban militants in Pakistan’s northwestern tribal areas. Military officials that 119 militants had been killed on Thursday and Friday. There are also reports of aerial strikes on hideouts in Tirah valley on Saturday which killed over 20 fighters. The Taliban condemned the decision to re-introduce the death penalty and said on Friday they would consider killing more children if any militants were executed. "We can create a mourning situation at the homes of many army generals and politicians," spokesman Mohammad Khurassani said in a statement emailed to reporters, according to AP. The deaths of the children at the military school have caused outrage in Pakistan. 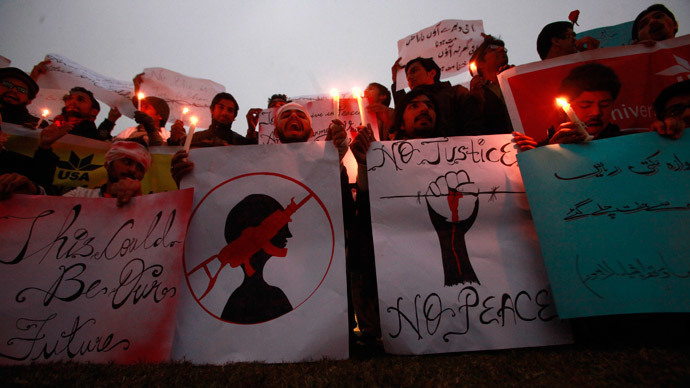 Protests took place outside the Lal Masjid mosque in Islamabad, which is also known as the Red Mosque. They were demanding that the place of worship stops supporting militants.